Cell tower disguised as a tree. 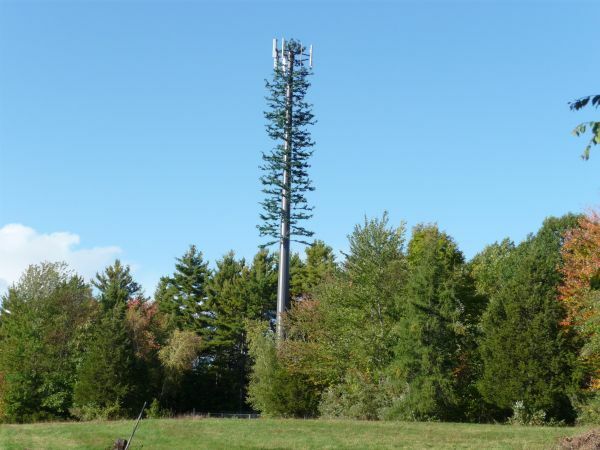 Cell tower radio frequency radiation, a form of environmental pollution, has a biological effect on wildlife. In his ARTICLE ”Electromagnetic Pollution from phone masts. Effects on Wildlife”, biologist Alfonso Balmori cites various studies showing that wildlife exposed to RFR (radio frequency radiation) suffer a deterioration in health and reproduction, and exhibit abnormal behavior changes. A study conducted in Valladolid Spain between 2002 and 2006 noted a significant decline in the sparrow population in areas of high electric field strength (measurement of radio frequency and microwave). Similarly, coinciding with the roll out of cellular technology, the United Kingdom and other European countries have documented a substantial decline in sparrow populations and other species of birds. Birds exposed to radio frequency radiation show signs of immune and nervous system stress, noted in part by plumage deterioration, exhibit changes in their reproductive success and changes in behavior. In a nesting site 100 meters from a cellular base station many young storks died from unknown causes, nest construction failed and storks exhibited passive behavior. In Avila Spain, town council removed a cell tower when nearby farmers complained it was causing miscarriages in their pigs. After its removal, miscarriages stopped. In the United States radio frequency radiation standards for cell towers are amongst the least protective in the world, with a limit of 580 to 1000 micro watts per square centimeter. Cell towers in Australia maintain a limit of 200 micro watts per square centimeter while New Zealand’s safety limit is 0.02 micro watts per square centimeter! In May 2011 the World Health Organization International Agency for Research on Cancer sent out a PRESS RELEASE classifying radio frequency radiation as a possible carcinogen (Group 2B). For more information about radio frequency radiation see the BIOINITIATIVE REPORT. This 2012 report documents scientific evidence on electromagnetic fields and provides reason for a biologically-based safety standard for cellular technology (current safety standards are thermal-based, not biologically-based). For an overview of this report, see the SUMMARY FOR THE PUBLIC. Sign our Keep Baldy Wild’s Statement of Purpose Petition!